After seeing The Imitation Game earlier this week and how it concerned itself with addressing the life of a genius while centering around a pivotal narrative in his life I more or less expected the same from The Theory of Everything where instead of the subject being a mathematician they are a theoretical physicist. While my main complaint concerning the biopic is that most follow a typical template The Theory of Everything does so with seemingly no ambition to be anything more. This was unanimously my complaint with the story of Alan Turing while working to its advantage because the story it chooses to document is infinitely compelling. With the tale of Stephen Hawking though, the story is simply him. This is a documentation of his life events, but there is no driving force or specific goal behind it that desperately needs to be accomplished. A set objective isn't always necessary and great, intriguing films can certainly be made without the need of some overarching intent driving the narrative, but here it felt as if that certain something was missing. That said, director James Marsh who is mainly known for his documentaries, has crafted a movie that is more memorable for its performances and smaller moments than anything else. As far as what the film is actually missing to make up for its somewhat lackadaisical approach to plot is hard to say. It has the two young stars at the head aging unconvincingly, it centers around a man who had to overcome great odds in his life and accomplished a great many things despite those odds set against him, but it also never challenges the audience to feel his struggles. I imagine the majority of the American public would recognize Hawking's name if not for the reasons he is well-known and so one has to wonder why this story was worth telling if the real life Hawking received credit where credit was due. As the film progresses though I began to understand why Marsh kept things as simple as he possibly could; this isn't a story about a specific thing Hawking accomplished, but the pure miracle that he kept accomplishing things at all after being diagnosed with motor neuron disease in 1963. I understand the approach and the finished product is a fine enough summation of what has been a rather extraordinary life, but that doesn't excuse the fact it still feels like something crucial is missing that might have made the difference in a good film and an exceptional one. 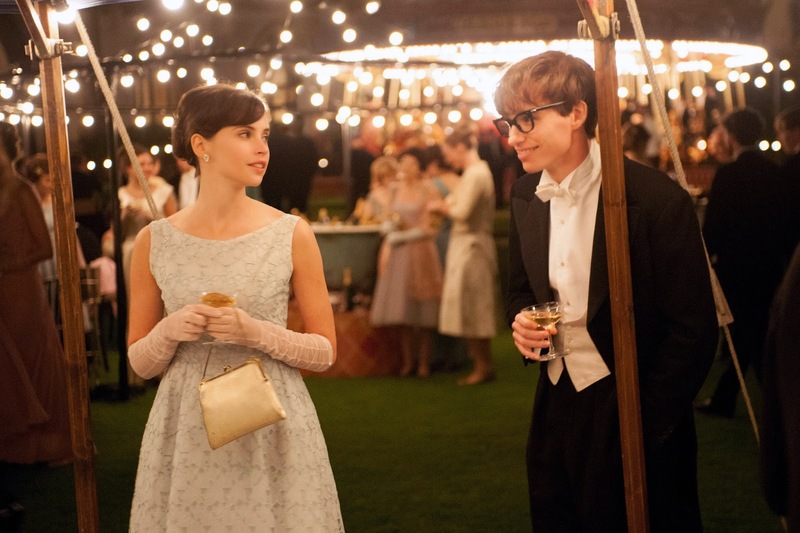 Jane Wilde (Felecity Jones) accompanies Stephen Hawking (Eddie Redmayne) to the May Ball. While this is indeed a story of someone overcoming great odds, this is just as much a story about Stephen Hawking as it is Jane Wilde. Wilde was the literature student Hawking fell in love with while studying at Cambridge University that would shape the course of his life. Meeting just before his diagnosis at the age of twenty-one, Jane essentially pledged her life to Hawking with the knowledge of what he would be going through and the toll it would likely take both on her and their relationship. The doctors initially gave Hawking two years to live to which he immediately responds by ignoring everyone and diving head first into his work so that he may leave as much of his research and as many of his theories behind as he possibly can. Upon diagnosis he is in the midst of putting together a theory concerning time and the beginning of the universe that deals with black holes in order to accomplish his doctorate. His work doesn't suffer, but his condition slowly worsens. Wilde makes it a point to not allow Hawking to ignore happiness in what could be the final years of his life and pledges her love to him resulting in a marriage and eventually three children to which the film documents neatly while zooming in to detail the increasingly difficult practice of one capable person keeping an entire family together. In essence, while we are meant to take away Hawking's startling ability to have a life and a family and generally something of a normal existence while dealing with his ever evolving disease, this opens up the struggle of Wilde's everyday life. 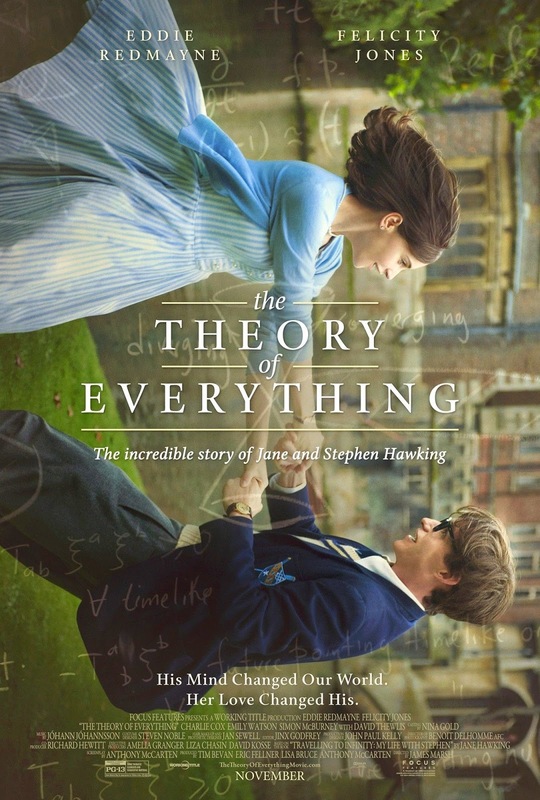 The Theory of Everything is surprisingly light on the discussion of Hawking's actual work or what he did to have such an impact on the world of science, but it is also somewhat refreshing because this leaves more than enough room for the film to focus on Hawking as a person. Seeing as the film is based on Jane Hawking's memoir, "Travelling to Infinity: My Life with Stephen", we understand better the dual edged nature of the relationship and how, despite the actors transcending the rather broad approach to the material, for all Stephen's accomplishments there are plenty of Jane's sacrifices that go unnoticed. It is Eddie Redmayne and Felecity Jones who elevate the material from the widely comprehensive way it has been formatted by screenwriter Anthony McCarten (Death of a Superhero) into something more akin to a true spectacle though. 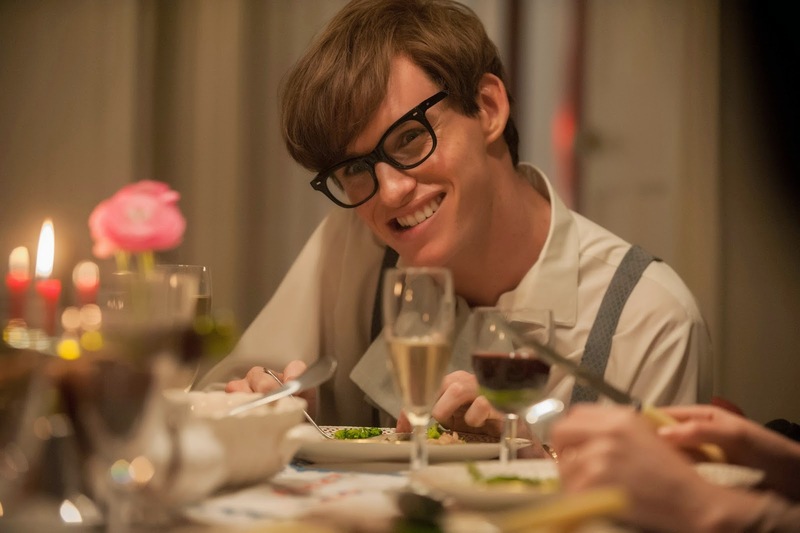 From the get-go we are introduced to Redmayne's Hawking as a complete intellect who wears thick, black-rimmed glasses yet walks with a swagger contradicting his physical appearance and assumed mentality. He meets Jones' Jane at a party where she is accompanied by a friend who immediately dismisses Stephen as being weird. This doesn't dissuade Jane from her interest in the man as Stephen approaches her, almost fearlessly, and they quickly exchange dialogue that cuts down descriptions of themselves into something less than anecdotes. Though they probably shouldn't care for one another there is an inherent connection between the two, a deeper understanding that never becomes anything resembling conflict despite coming at the world from two vastly different points of view. For the first half hour or so of the film we are allowed to get to know the Stephen Hawking and Jane Wilde before what would become the rest of their lives. It is in these small, intimate moments that get picked out of the vast landscape of their lives that the actors are given the chance to not only develop who these people are, but make the movie as intimate and touching as the experiences themselves likely were. Everyone recognizes Stephen Hawking as the man in the wheelchair who speaks through a computer, but we know little of his personality or who he was before he became confined to that label. Redmayne is able to give him this, to show who he was as a young man and give light to his rather charming facade that outweighs the intimidating intellect he so clearly hides behind it. While Redmayne is only given this small window of the film to deliver a full character before having to communicate his emotions largely with body language and facial expressions Jones has the unknown character arc that deals with being a woman who starts out as being endlessly optimistic. Jane expects all of the bad fortune to work itself out in one way or another, defiant to what common knowledge believes and thus continues to get herself into deeper situations where it becomes anything but what she expected her life to be. Eddie Redmayne as Stephen Hawking. There is a line in the film where Stephen explains to Jane how the fluorescence in Tide washing powder is caught by the ultraviolet light thus making the men's whites glow at the annual Cambridge May Ball. He doesn't say this to come off as a prude or to show off, but instead uses it as a conversation starter, a little tid-bit of information that turns into a full-fledged conversation. Hawking goes on to explain how stars emit UV radiation when they are born and when they die so if we were to see the night sky in UV light all we would see would be these beautiful explosions of birth and death. This scene is immediately followed by shots of fireworks transitioning to Stephen and Jane dancing alone together away from the crowds, taking in the moment. The nice metaphor here is that these limited explosions among the vastness of space are the small, beautiful moments we experience in life. This theme is explored by Marsh and McCarten throughout their film in both boldly hitting the high points of their subjects life while capping off the story with a perspective moment so rooted in intending to pull a tear and make the audience appreciate the short time we have on earth that it's easy to label as manipulative, but is still effective in eliciting a genuine emotional response. These nice things being said, it should be noted that not all of Hawking's impressive love story comes wrapped in a happy ending. He and Jane divorced in 1995 while Hawking went on to marry Elaine Mason (Maxine Peake) and while the movie makes the best of this it can given it's supposed to be telling this great love story, it is easy to see through the guise. In some strange way it also works though as we realize Jane wanted to get as much out of Stephen's expected two years as possible, but did she regret the decision when that time came and went? One hates to think that way, but the longer their relationship lasted and the more responsibility that was thrown on Jane the more you see the light fading from her once glistening eyes that worshipped the ground he walked on. The Theory of Everything attempts to transcend the typical biopic by being more involved in who its characters are than the story it's telling, but would undoubtedly end up feeling supremely standard were it not for the brilliant performances of the lead actors.